Here's a photo Joe Carabeo took of Jeff Smith (Bone, RASL, Tüki Save the Humans) with Magic Bullet after Joe presented him with a copy of our Halloween issue (Magic Bullet #7) at Small Press Expo 2013 earlier this year. We are currently planning our next issue. The deadline is January 15, 2014. Please check out the specs and guidelines by clicking the "Submit Your Comic" tab at the top of the website. Magic Bullet is listed as a comics highlight of the year by Washington City Paper. It is a honor for the publication to be recognized. 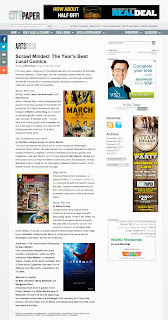 Thanks to Michael Rhode for the write-up! Members of the DC Conspiracy, a comics-creating collaborative, will be working on their actual page submissions for the Spring 2014 edition of Magic Bullet, a free, semi-annual comics newspaper distributed throughout the greater Washington, DC area. The artists will each have onsite working hours so you can watch the artists draw and see the magic unfold. There will be “blank” comic pages available if you want to try your own hand at making a comic and leave it behind where it will be hung in the Gallery and posted by Artisphere to a Facebook album you can tag and share. 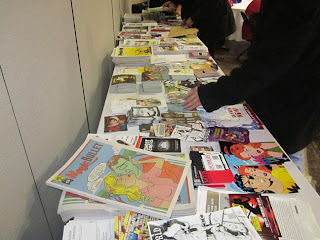 The first 20 people to leave a comic behind will receive a pass to the 2013 Small Press Expo the weekend of September 14. 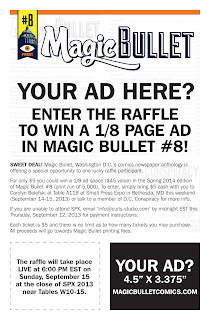 Magic Bullet, Washington D.C.’s comics newspaper anthology is offering a special opportunity to one lucky raffle participant. 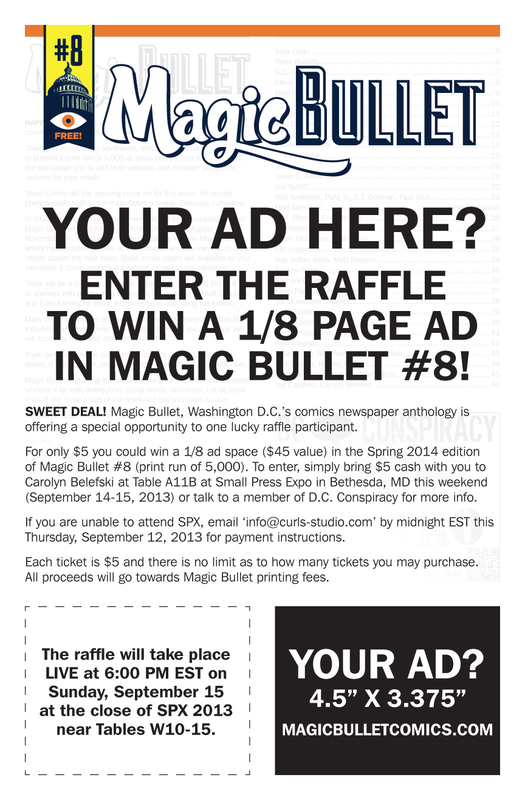 For only $5 you could win a 1/8 ad space ($45 value) in the Spring 2014 edition of Magic Bullet #8 (print run of 5,000). To enter, simply bring $5 cash with you to Carolyn Belefski at Table A11B at Small Press Expo in Bethesda, MD this weekend (September 14-15, 2013) or talk to a member of D.C. Conspiracy for more info. If you are unable to attend SPX, email ‘info[@]curls-studio[dot]com’ by midnight EST this Thursday, September 12, 2013 for payment instructions. Each ticket is $5 and there is no limit as to how many tickets you may purchase. All proceeds will go towards Magic Bullet printing fees. 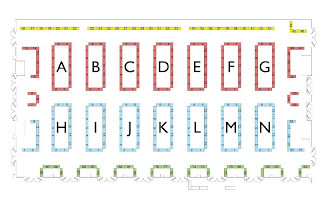 The raffle will take place LIVE at 6:00 PM EST on Sunday, September 15 at the close of SPX 2013 near Tables W10-15. Thanks to Matt Dembicki for the raffle idea. Visit him and other members of D.C. Conspiracy at SPX Tables W10-15. 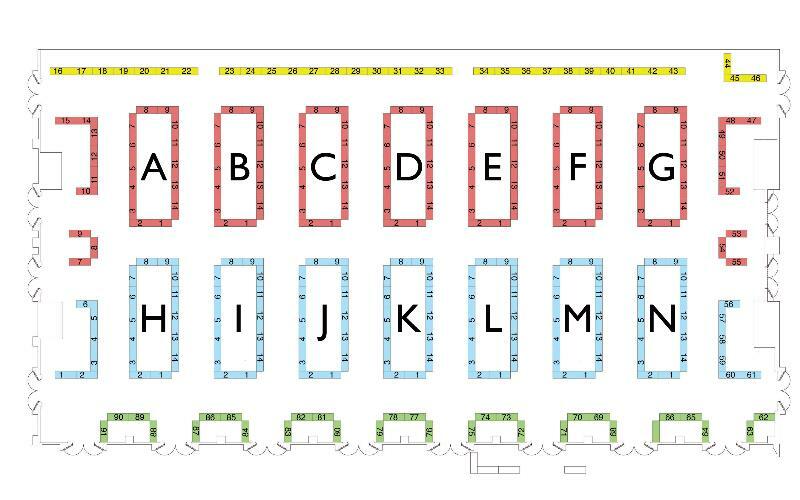 Above is the SPX floor map so you can find our tables. If you win, you may use $45 as credit towards a larger size ad, if preferred. 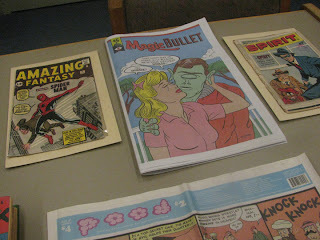 Magic Bullet #7 (Washington, D.C.'s free comics newspaper, published by D.C. Conspiracy) has been printed. 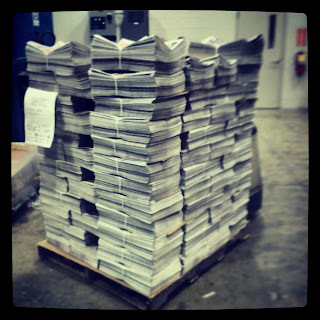 Big thanks to Joe Carabeo who picked up all 5,000 direct from the printer in Maryland last week. 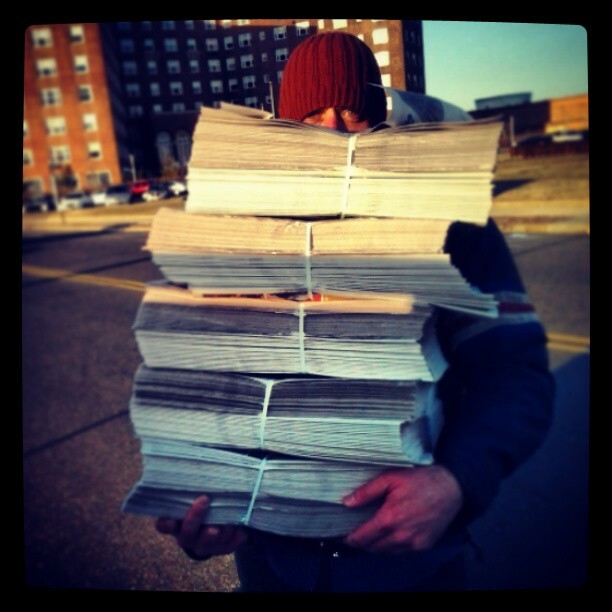 The newspapers are hitting the streets and several contributors have picked up their bundles. I know you can grab your free copy for sure at the following locations: Laughing Ogre Comics (Fairfax, VA), Sunflower Vegetarian Restaurant (Vienna, VA), Bad Decisions (Baltimore, MD), Gorilla King Comics (Baltimore, MD), Artisphere (Arlington, VA), and many more to come... be on the lookout! 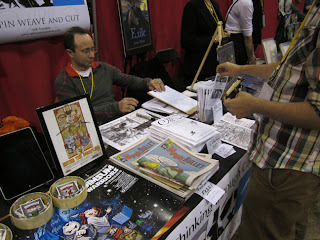 We plan to have the newspaper at Baltimore Comic-Con in two weeks and Small Press Expo in three weeks. 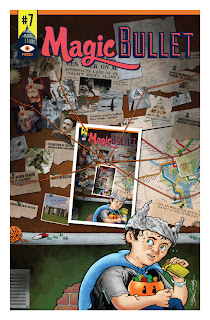 I am delighted to present to you the cover of Magic Bullet #7. 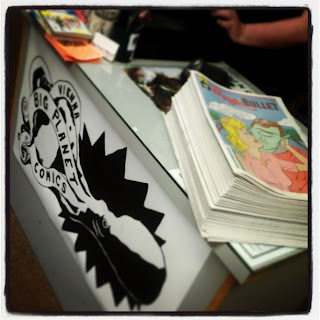 Magic Bullet is Washington, D.C.’s free comics newspaper published by D.C. 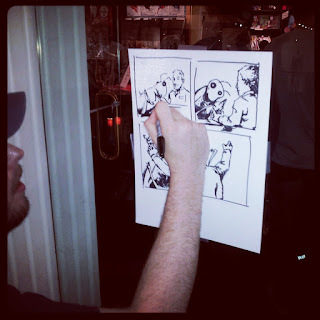 Conspiracy, a comics creators’ collective in the capital region. Steve Conley was tapped to illustrate the cover art and Matt Dembicki contributed the color center spread. 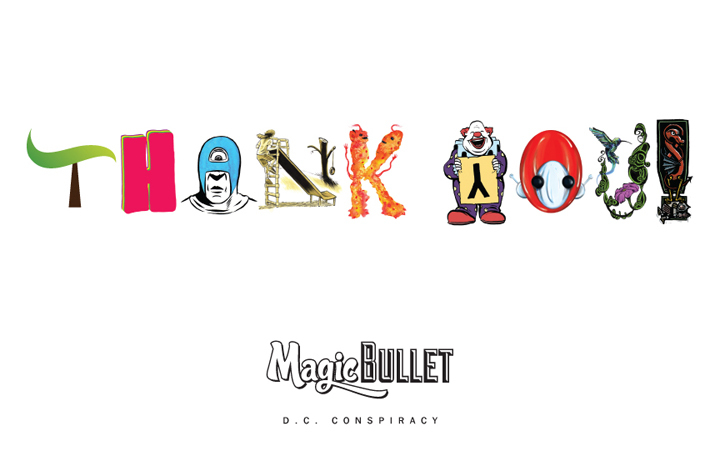 Thanks to El Jefe Design for the design of our masthead, which we started using in Magic Bullet #6. This issue is Halloween themed and has a print run of 5,000. It will be hitting the streets shortly. Be sure to look for it around town and pick up this free publication. 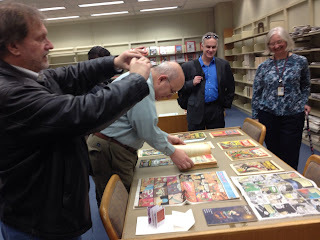 Thank you to all who submitted and we urge you to submit your comics to be considered in future editions. I plan to bring several bundles to Bmore Into Comics next Saturday, August 24, 2013. We will also be distributing Magic Bullet to local establishments in DC, MD, and VA (places like book stores, restaurants, theaters, tattoo parlors, record shops, etc.). D.C. 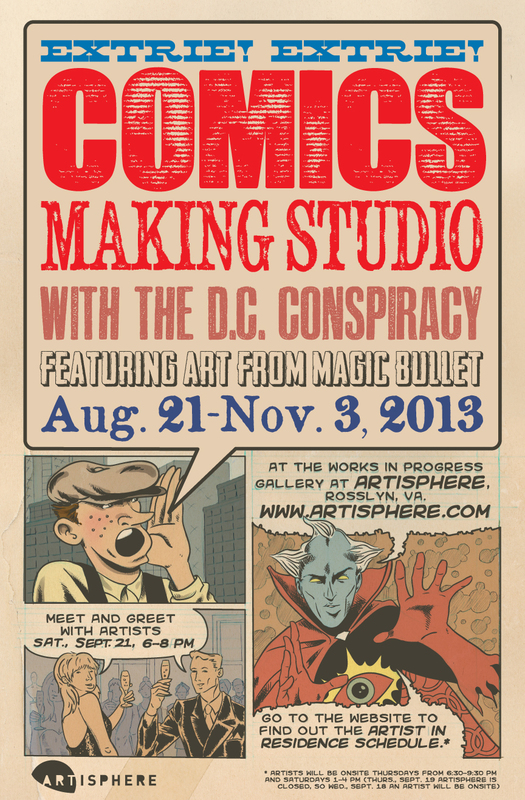 Conspiracy members will be showcasing original Magic Bullet art at Artisphere in Arlington, VA from August 21 thru November 3 in the Works in Progress Gallery. There will be a meet and greet on September 21 from 6 PM to 8 PM where you will be able to connect with many of us in-person. Major props to Matt Dembicki and Evan Keeling for being instrumental in organizing the exhibit. 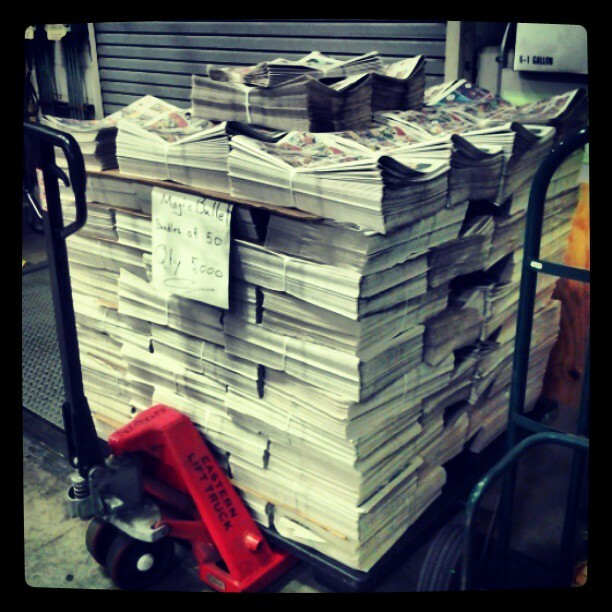 Magic Bullet contributors will be distributing the newspaper for free at many of their convention appearances in 2013. We will certainly have Magic Bullet #7 at Baltimore Comic-Con, Small Press Expo, New York Comic Con, and more! Stay 'tooned for more information about distribution of Magic Bullet #7 as well as details about advertising and comic submission for the next issue. 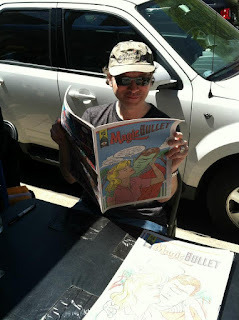 If you are interested in advertising and comic submission guidelines, connecting with us, or attending our meetings, visit magicbulletcomics.com for information. It has been either a trick-or-treat editing this edition of Magic Bullet. I'll let you decide witch! 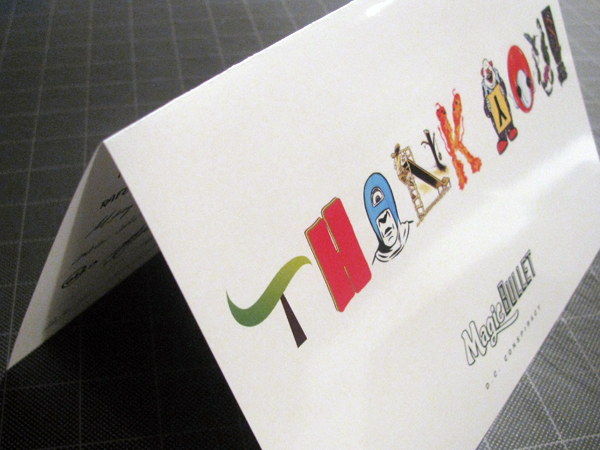 Here is the thank you card we organized and mailed to our advertisers and others who helped us print and distribute Magic Bullet #6. I wanted several people to contribute art and come together in an organic way for the card. The process included making small paper strips with the artist names pulled from a hat in order of the characters in the words 'Thank You!' The artists could make their assigned letter in any medium or style in a clever way as long as it is legible. The card came out great printed on glossy paper. For the inside, we collected digital signatures and most of the contributors were able to be a part of the project with their John Hancock. This is the first time we've sent out thank you cards. It's a good way to connect with the people and organizations who made our project happen. 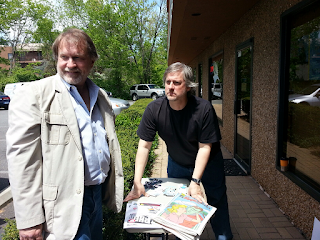 Evan and I were at Big Planet on U Street, to hand out copies of Magic Bullet #6. We arrived a little before the 11 a.m. opening, and even then, there was a line about 10 deep waiting outside the door. Since the store is narrow, and since we didn't want to disrupt the flow of people coming in, we stood up by the register and passed out copies of the newspaper to everyone who came to the counter. Nick and Jared were managing the store and the comics, and Eden Miller stopped by to hang out for a bit and bring refreshments. Then, when the doors did finally open, it was pretty much a flood. There was a constant stream of people coming in the door, rushing to the free racks, spreading to the rest of the store and then lining up at the cash register. Evan and I passed out about 2.5 bundles in 2 hours to everyone who left with a comic. Everyone seemed happy and excited, and there was a really good, lively vibe in the store. It was just a fun place to be. By 1:00, we had passed out our bundles, and the initial rush had subsided, so we took the opportunity to slip out, then. I left a few copies of my mini-comic, "Howzit Funnies," in some of the empty slots on the free comic rack; bought a few comics for myself; gave our thanks to Big Planet; and bid adieu to another FCBD. 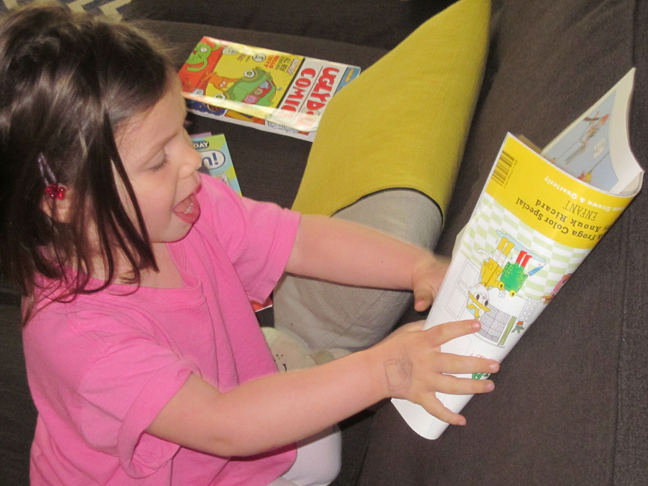 The little girl reading is my daughter enjoying some of the free comics I brought home to her. we had a small table, and the size of the store made outside the best choice. They had a big line when we arrived and a healthy crowd for most of the two hours we were there. We handed out pretty much all the copies we had along with some bookmarks, "District Comics" zipper pulls, fliers for Steve Artley's comic, and a color version of my "Magic Bullet" page that I printed up for the event. We had a nice time chatting with each other, some of the customers, and of course the Winter Soldier (AKA Iggy -- see one of the photos). Super Official Statement: Hey, everyone! Matt Rawson and I attended Free Comic Book Day 2013 at Fantom Comics inside Union Station. Smiles could be seen all throughout the store. 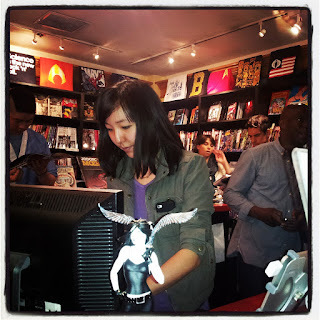 Special thanks to Fantom employee Esther Kim for coordinating the whole thing. She really went above and beyond the call of duty, putting together a cosplay contest, signings, and even paper plate masks for the kiddies. 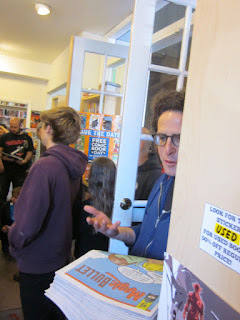 Matt and I didn't want to let Esther down, so we gave the entire shop a quick tutorial on how to make comics, taking suggestions from the customers. This resulted in Matt's wonderfully oddball "Man-eating Grasshopper" adventure. Overall, a great time. Fantom is my new favorite LCS and all the hard work DC Conspiracy has done to promote Magic Bullet #6 had clearly paid off. People knew about it and were looking for it as soon as they hit Fantom's door. 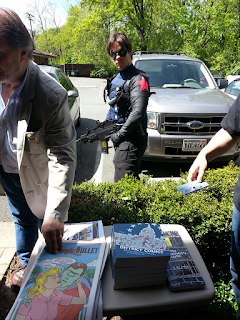 Free Comic Book Day at Fantom Comics was great! We were able to pass out many copies of Magic Bullet #6, and others said they already had it, which was equally as cool. Come afternoon, in the spirit of Free Comic Book Day, I decided to offer free sketches, which people quickly jumped on, and kept me busy for the rest of the time. So busy, in fact, that I totally forgot to take pictures of the drawings before I handed them out. It was such a fantastic time, I can't wait for next year! We had a great comics carnival under tents on the sunny sidewalk outside Dewey's Comic City in pedestrian-friendly, student-heavy Madison, NJ! About 50 Magic Bullet 6s were handed out, 20 pre-signed by artist Diana Leto (making us proud at the AdobeMAX conference in LA that day) and then defaced by me. Lot of interest from adventurous fanboys & girls and non-usual suspects wishing to check out the variety of voices in MB6's big comic cornucopia! The shot has been heard from greater DC to Italy to NYC's MoCCA Fest to the cement hills of Jersey! Here's a group shot from Big Planet Bethesda. 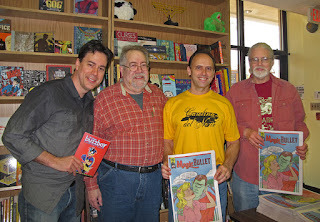 L to R: Buzzboy creator John Gallagher, who truly held court with the younger crowd, store owner Joel Pollack, me, and Bill Brown. It was great to greet & meet the crowd, and great meeting store guys Joel and Greg! 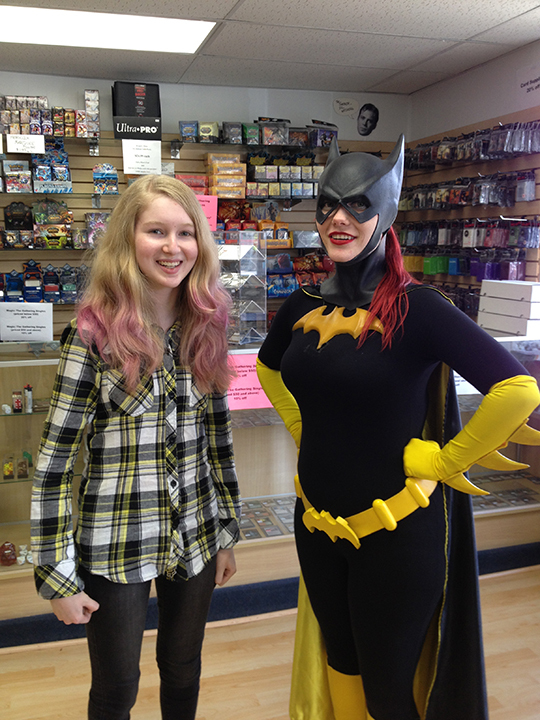 My daughter and I didn't do any signings, but we made a few stops, including one at Victory Comics in falls Church, where Laurel had a color coordinated moment with Batgirl. Beyond Comics was busy and I barely had time to think. A record setting day, from what I hear. I signed a bunch of Magic Bullets and people looked happy. Here's a snap I took of Rafer and John Shine, et al. at John's Gaithersburg shop. Free Comic Book Day is great because it marks the start of a warmer season. There's usually a comic book movie premiere that weekend (this year was Iron Man 3) and it's Kentucky Derby Day. 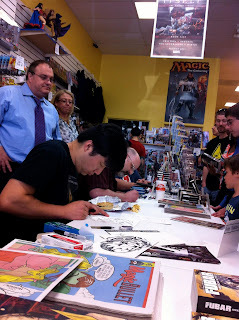 This year was the first year I've made a FCBD appearance, but I have attended practically every year. Joe Carabeo and I were at Laughing Ogre Comics in Fairfax, VA to distribute Magic Bullet #6 for free and we also set up a table to sell our own comics. Laughing Ogre did a good job with the new layout of the free table and handling the crowds. There were a lot of cosplayers - kids and adults alike all enjoyed taking photos with the characters.We met a ton of people and stayed for 6 hours. 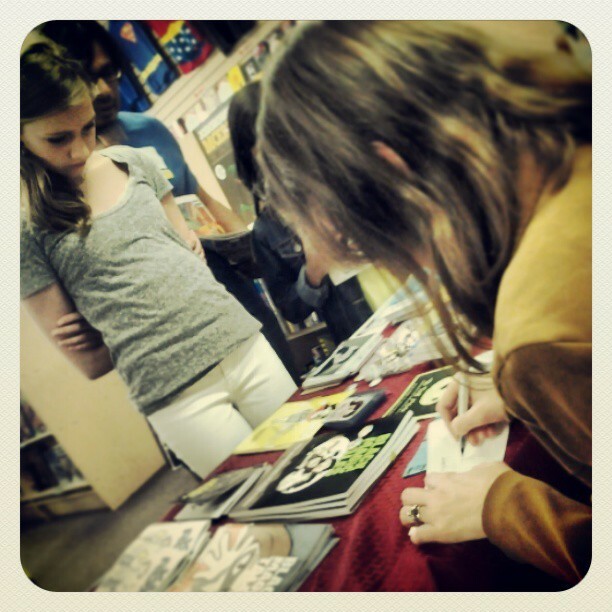 I'll always have the memory of this girl who got very excited about my comic strip, Curls. She had the biggest smile on her face and was in a trance watching me sketch. This year's 10th anniversary of Free Comic Book Day was pretty exceptional for me. One, because every year since it's inception I've always wanted to take part in the celebration of Free Comic Book Day. And two, because Free Comic Book Day was the day that I found out about a book that would became super influential to me as a storyteller, that being the David Lapham self-published book, Stray Bullets. So for me this year to finally take part as a Free Comic Book Day guest at Laughing Ogre Comics in Fairfax, VA, and have my own stories for people discover was pretty amazing. I loved being able to tell casual people who would never go into a comic book store about our books, Black Magic Tales, Kid Roxy and The Legettes. Some never even knew making your own books was even possible -- and now they know. The turn out was smashing, very few moments of down time and the layout that Laughing Ogre Comics had for their free books and us was perfect for our exposure, they did a great job and would love to continue to cross promote with them. A huge surprise to me was we even sold a whole bunch of books, and Magic Bullet #6 was flying into new hands. So, overall, I'd say it was a great day. Several Magic Bullet contributors will be at nine locations next Saturday to celebrate Free Comic Book Day, a day when participating comic book specialty shops around the world give away comic books absolutely free to anyone who comes into their shops. 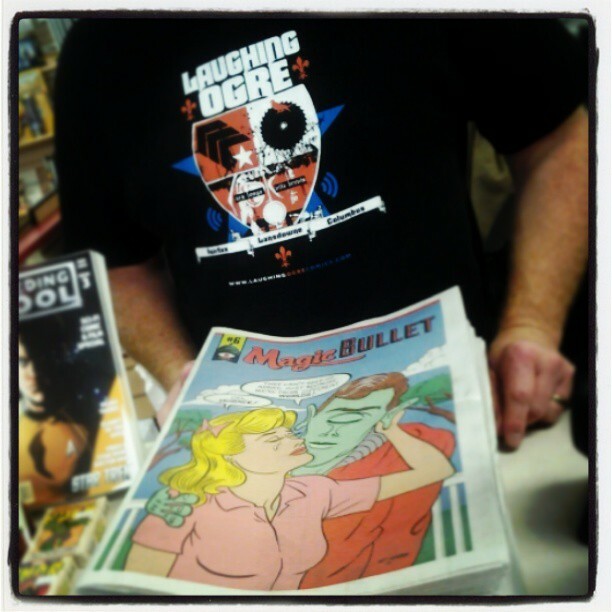 Please stop by to say hello and pick up a free copy on Magic Bullet #6. 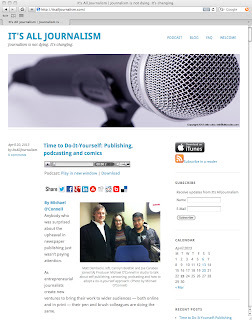 Andrew Cohen, Evan Keeling - Big Planet Comics on U Street, D.C.
Troy-Jeffery Allen, Matt Rawson - Fantom Comics in Union Station, D.C.
Matt Dembicki, Joe Carabeo, and Carolyn Belefski were interviewed by Michael O'Connell for his show, It's All Journalism. 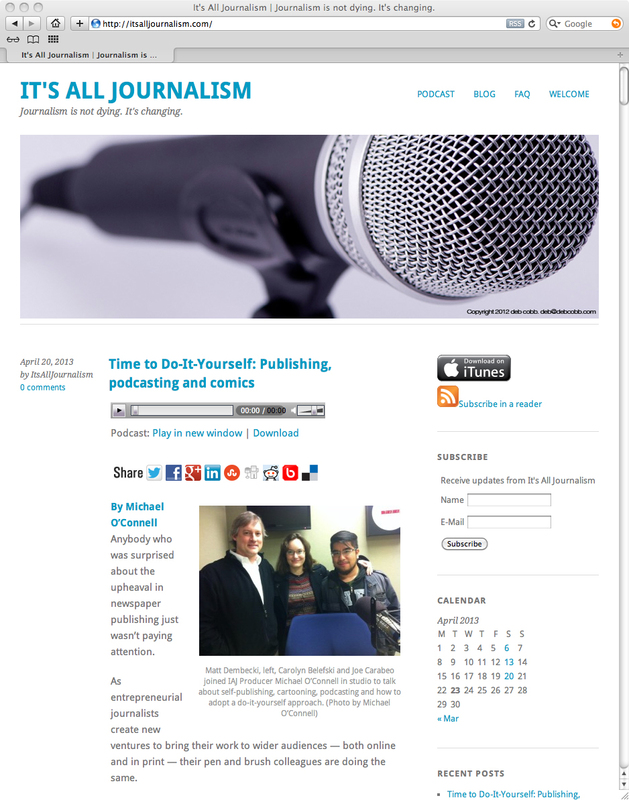 We discussed self-publishing, comics, District Comics, and Magic Bullet. Joe and Carolyn also discussed their podcast, The Carolyn & Joe Show. 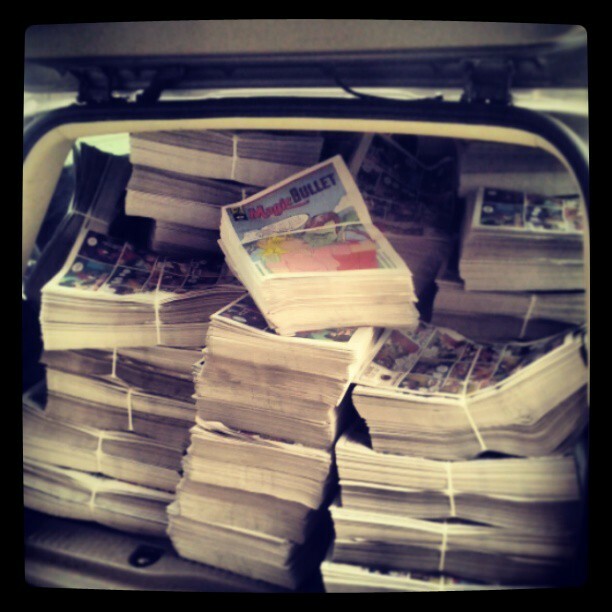 You can also get Magic Bullet #6 for free at one of the multiple locations we have made drop-offs to. Refer to the "Locator" tab above for the listing. We are also working on a digital edition. Look for it in the coming weeks. In addition, D.C. Conspiracy Distro is having a spring cleaning sale! For the entire month of April, all orders of $5.00 or more will receive six issues of Plastic Farm and Magic Bullet #6 for free! This past weekend was MoCCA Arts Fest in New York, put on by the Society of Illustrators (and also an advertiser in Magic Bullet #6). 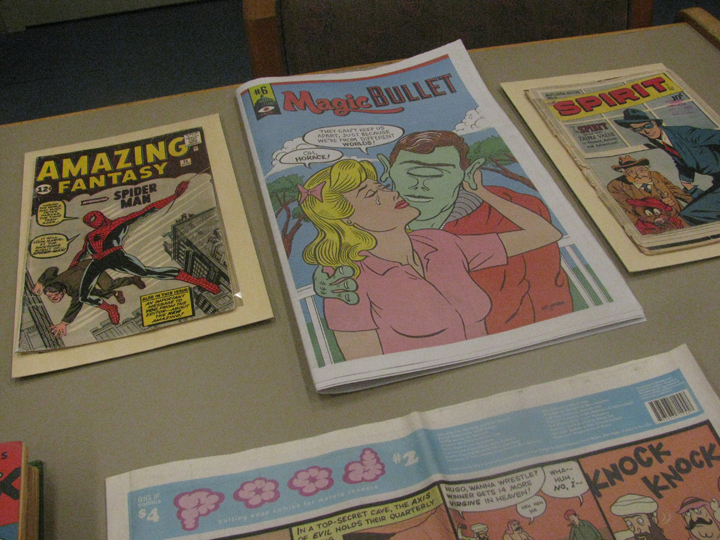 Adam McGovern had copies of the publication at his table and also at the freebies table, as Magic Bullet #6 is a free publication. Thanks to Adam for the photos above. Above is a photo my friend, Nadia, was able to take of Adam, his friend Nick, and Magic Bullet #6 at his table. In other reports, I've been hearing about Magic Bullet #6 flying off the shelves at many locations. Also received an email saying, "I can personally attest that this magazine FLEW off the table at the most recent Shoff con in Tyson's!" Be sure to click the "Locator" tab in the site navigation above to see where you can pick up a free issue. Get a hold of one before they are gone! 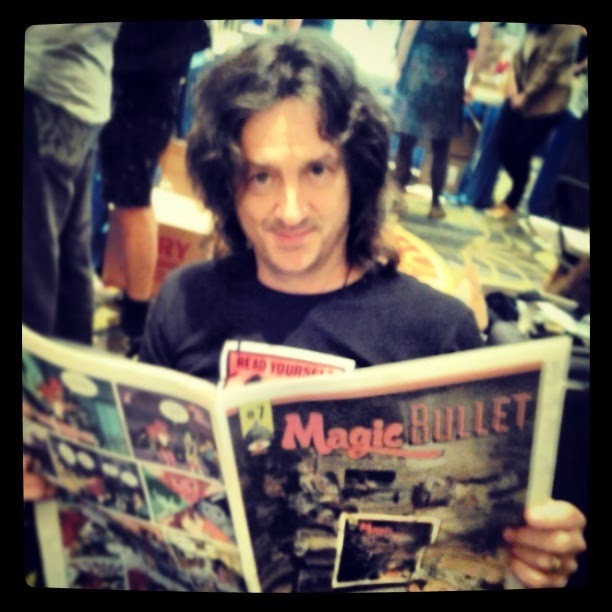 Don't forget: Matt Dembicki (editor of District Comics) will be spreading Magic Bullet #6 to Ohio when he exhibits at SPACE this coming weekend - April 13-14, 2013. I will have some available at the Annapolis Book Festival at Key School this Saturday - April 13. 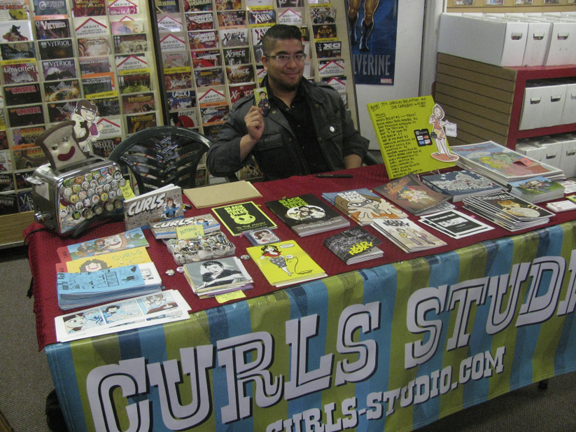 Look for Curls Studio at ComicKey! in Artist Alley - Manse Addition in Room 2. 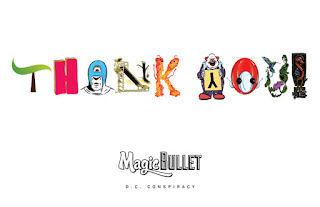 Also in April, I'll be sure to have some Magic Bullet #6 for Awesome Con D.C. at the Curls Studio table on April 20-21, 2013 at the D.C. Convention Center. 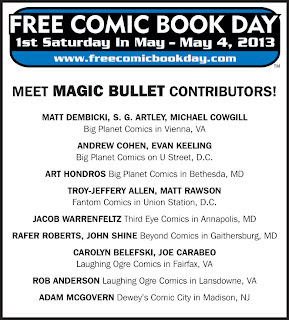 On Free Comic Book Day - Saturday, May 4 - Fifteen of our artists and writers will be at nine different locations in DC, MD, VA, and NJ to distribute Magic Bullet #6. We look forward to seeing you all in-person soon! 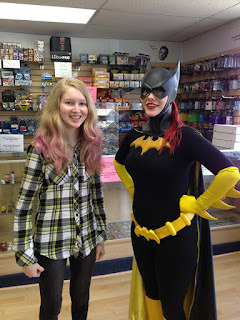 This past Saturday was Asbury Park Comic Con. Jacob Warrenfeltz, Rafer Roberts, Joe Carabeo, and myself were the D.C. area crew exhibitors at this show. We distributed Magic Bullet #6 and a few of our contributors took bundles to disperse in the New Jersey and New York areas. Above is an image of Jacob taking his bundle stacks. Be sure to look for Magic Bullet #6 at the MoCCA Arts Festival on April 6-7, 2013 in New York. 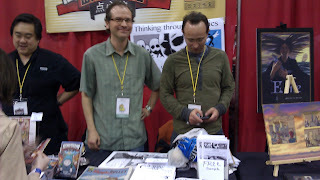 You can find it with Adam McGovern and Nick Sousanis at table B45 1/2 A. We also plan to have it at the free/giveaway tables, as it is a free publication. Matt Dembicki will also be spreading Magic Bullet #6 to Ohio when he exhibits at SPACE on April 13-14, 2013. I will have some available at the Annapolis Book Festival at Key School on April 13. 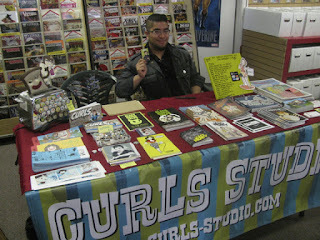 Look for Curls Studio at ComicKey! in Artist Alley - Manse Addition in Room 2. 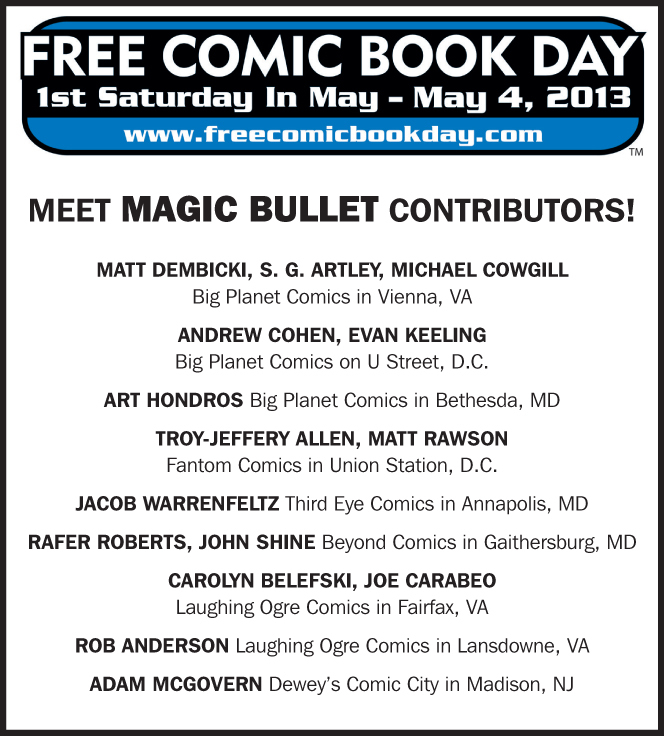 Later in April, I'll be sure to have some Magic Bullet #6 for Awesome Con D.C. at the Curls Studio table on April 20-21, 2013 at the D.C. Convention Center. Comics World (Annandale, VA) -- Magic Bullet #6 is the ONLY English-language comic in this Korean store! Send us your photos when you discover Magic Bullet #6! Email 'info[at]curls-studio.com' to be included in the experience. 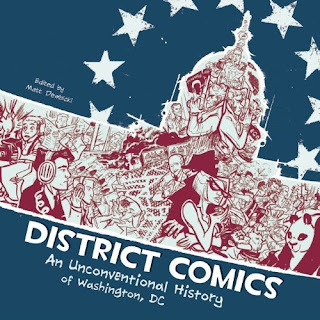 Don't forget, on Free Comic Book Day (May 4) we will be scattered at nine different locations in three states, plus the District of Columbia. This will be our big day where we will be able to meet the public in-person.